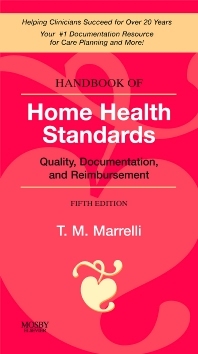 Handbook of Home Health Standards: Quality, Documentation, and Reimbursement includes everything the home care nurse needs to provide quality care and effectively document care based on accepted professional standards. This handbook offers detailed standards and documentation guidelines including ICD-9-CM (diagnostic) codes, OASIS considerations, service skills (including the skills of the multidisciplinary health care team), factors justifying homebound status, interdisciplinary goals and outcomes, reimbursement, and resources for practice and education. The fifth edition of this “little red book” has been updated to include new information from the most recently revised Federal Register Final Rule and up-to-date coding. All information in this handbook has been thoroughly reviewed, revised, and updated. Provides practical tips for effective documentation of diagnoses/clinical conditions commonly treated in the home, designed to positively influence reimbursement from third party payors. Lists ICD-9-CM diagnostic codes, needed for completing CMS billing forms, in each body system section, along with a complete alphabetical list of all codes included in the book in an appendix. Incorporates hospice care and documentation standards so providers can create effective hospice documentation. Emphasizes the provision of quality care by providing guidelines based on the most current approved standards of care. Includes the most current NANDA-approved nursing diagnoses so that providers have the most accurate and up-to-date information at their fingertips. Identifies skilled services, including services appropriate for the multidisciplinary team to perform. Offers discharge planning solutions to address specific concerns so providers can easily identify the plan of discharge that most effectively meets the patient’s needs. Lists the crucial parts of all standards that specific members of the multidisciplinary team (e.g., the nurse, social worker) must uphold to work effectively together to achieve optimum patient outcomes. Resources for care and practice direct providers to useful sources to improve patient care and/or enhance their professional practice. Each set of guidelines includes patient, family, and caregiver education so that health care providers can supply clients with necessary information for specific problems or concerns. Communication tips identify quantifiable data that assists in providing insurance case managers with information on which to make effective patient care decisions. Several useful sections make the handbook thorough and complete: medicare guidelines; home care definitions, roles, and abbreviations; NANDA-approved nursing diagnoses; guidelines for home medial equipment and supplies. Small size for convenient carrying in bag or pocket!